(PhysOrg.com) -- At the recent Society for American Archaeology meeting in Sacramento, California, archaeologist Michael Callaghan from the University of Texas presented his team's findings from the ancient site of K'o (now modern-day Guatemala) and what they believe to be the oldest known royal Mayan tomb. storage chamber, where a burial was performed. Within this storage chamber they discovered a body they believe to have been a man in his fifties who was reasonably healthy when he died. Within the chultan they also discovered a collection of seven ceramic containers, including the piece that signified the royal find. 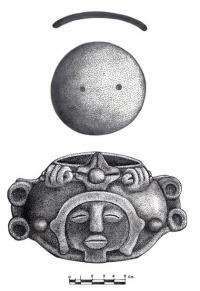 An incense burner with the jester god headdress symbol, a known symbol of royalty, was found alongside the body. The pottery found comes from the period when Mayan ceramics began to change to that of the deep red color, dating this find back to 350BC. Radiocarbon dating of a bone sample from the body confirms this date, making this find the oldest royal Mayan tomb ever discovered. Until this discovery, the oldest Mayan ruler to be discovered was found in San Bartolo in 2005 and was dated back to 100BC. The discovery in San Bartolo was also found underneath a home and not within a pyramid temple which is common with the Mayan rulers of a later period. This discovery shows that the Mayan idea of rulers and their civilization had been in place much longer than had originally been believed by scholars. Tomasic and his team believe that continuing to excavate under more homes in the area may reveal more of these royal burials.